Sister Act opened at Beef and Boards Dinner Theatre, Indianapolis, this week. As a top film with the same title (1992) starring Whoopi Goldberg, Maggie Smith and Kathy Najimy, it was a big gamble adapting it for the live stage. Hitting the live theater circuit to mixed reviews from critics, the show about nuns and gun-toting gangsters was a smash hit with audiences the world over. It's almost better if you have not seen the film as the stage version differs in many ways. Most importantly ~ the music. It is no longer set in Las Vegas with 1950s hits being revamped into spiritually hip songs. Deloris Van Cartier (Zuri Washington) is not a Vegas casino lounge singer, but a '70s bar crooner in Philadelphia. And the songs, rather than the snappy golden oldies' Top 100 radio tunes, are originals written for the live show. The switch isn't the responsibility of B&B (or any other theater), but the creators of the musical. They are unfamiliar, but still peppy. 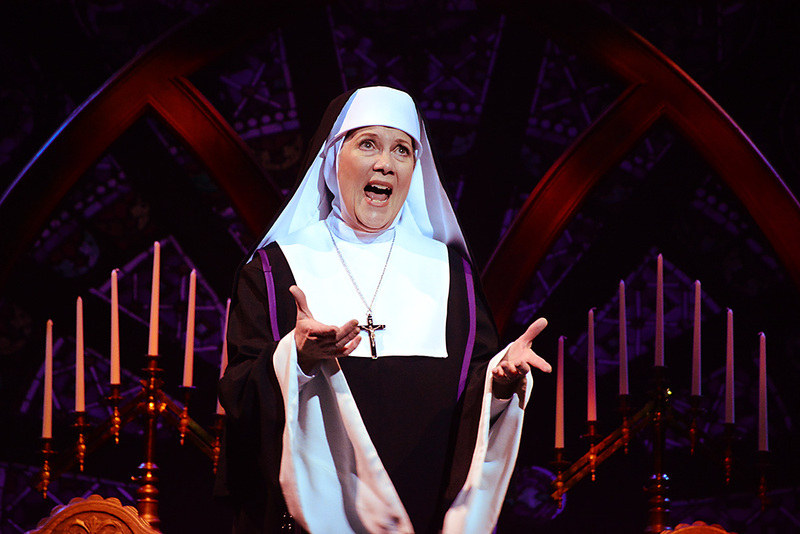 What made the film great was the audacity of Deloris to take lounge tunes and switch the lyrics for the Catholic nun's choir. 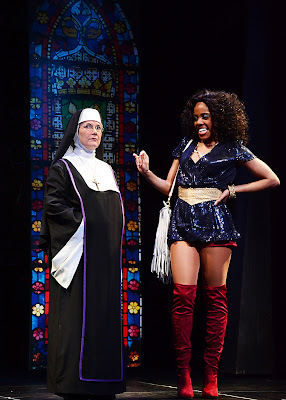 That, and the chemistry between Goldberg (as Deloris) and Smith (as Mother Superior). Add in Najimy's infectious laughter and quirky one-liners and there was no way the movie would not become a classic. But does the live production hold up against the film? Washington's Van Cartier zips along nicely with sarcastic remarks and annoys the Mother Superior (portrayed superbly by Suzanne Stark) delightfully, with their back-and-forth banter being one of the more enjoyable parts of the show. Another enjoyable part were the flawless vocals of Washington and Stark. 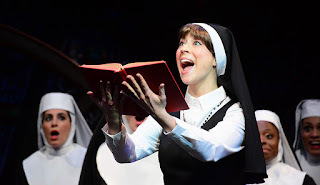 Sister Mary Robert (played impeccably by Gabrielle Harker), joins these two top-notch performers with her talented vocals and her portrayal as the timid nun-to-be. Most notable were Stark's rendition of "Haven't Got a Prayer," which required her vocal strength; Washington's, "Raise Your Voice" (with Nuns), and Harker's, "The Life I Never Lead." Lagging slightly in the middle with an extra dance and song, or two, from the gangsters, the play ran longer than a typical show. However, it is energetic, upbeat and outright funny. Bottom Line: Beef and Boards' Sister Act shines with its strong female performers for this family friendly (and hilarious) production.